As protests against President Trump's zero-tolerance immigration policies continue across the country, Julio Salgado's art feels more resonant than ever. Salgado, a queer, undocumented artist and activist who splits his time between the Bay Area and Los Angeles, makes artwork to empower the LGBTQ immigrant community. He's the artist projects coordinator of the pro-immigrant arts platform CultureStrike and the co-founder of the media platform Dreamers Adrift. But Salgado is best known for his project “I Am Undocu-Queer," a series of illustrations and political posters that celebrate the creativity and complexity of his community. As calls to reunite migrant families and abolish ICE intensify across the country, KQED Arts spoke with Salgado about his artwork and thoughts on the current situation at the U.S.-Mexico border. Can you tell me about yourself and your art practice? I started making political art when I was in college. My major was journalism and I joined the school newspaper [at California State University, Long Beach]. 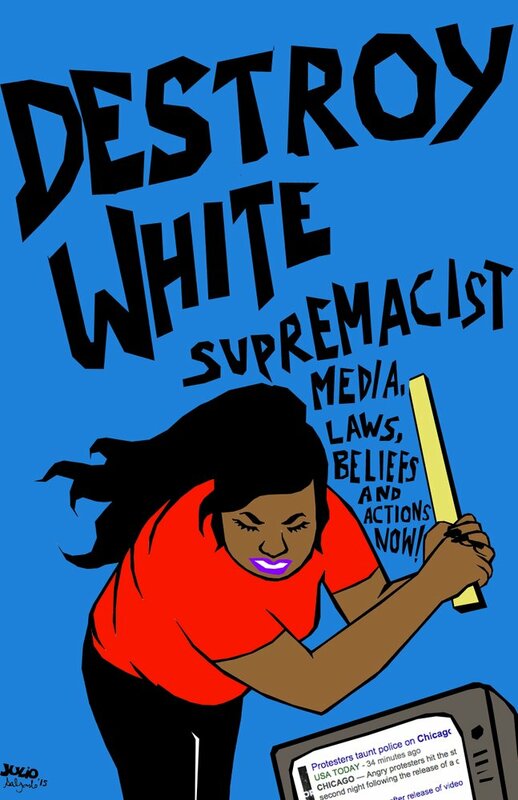 I think being part of the newspaper and doing editorial cartoons helped me find a voice, as I was dealing with being undocumented and being queer. It took me like nine years to finish college, but I finished. I officially walked in 2010 with my degree in journalism. I think 2010 was a really important year, because that was the year that a lot of us were pushing for the DREAM Act. It was the year that we came out as undocumented and unafraid. What I wanted to do as an artist was to document those moments and document what was happening, because I felt that the media, sometimes, was not getting it right. I felt that I had to mix my artistic and journalistic backgrounds to document what was happening. What's your reaction to the current situation at the border? One of the things that I have been telling my friends is that I haven't cried. I know a lot of people are really sad and, of course, I'm really sad and it pains me, but this is a story I have been following and something I've known about for many years. To me, art has been my therapy in dealing with a lot of these issues. I think art has been very instrumental for me to communicate a lot of my feelings about what is happening, as someone who has DACA and who is "protected," I don't know how much longer I am going to be protected. I can't control anything that is around me. I can't control the policies that are making it impossible for us to live decent human lives. What do you hope your artwork will convey? Who do you want to influence in this country? For many years, when I started doing a lot of these artworks, my message—and the message for a lot of us—was to show this country that we're good immigrants. The whole premise of the narrative around the DREAM Act was to convince the U.S. that, "Look! You could potentially give a green card and a path to citizenship [to people] who are going to college, who are going to pay taxes. We are the good crop. We are the good people you want to have on your team." Now, I think the art that I create is for us. 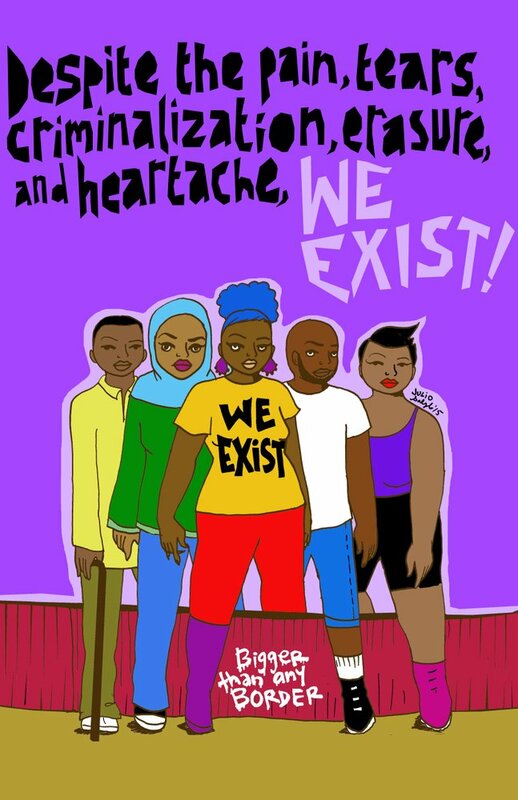 And by "for us," I mean for other queer people, other undocumented people, other people of color, because I want to make art that other people can see themselves in. I continue to make art that challenges people who might not know about the immigration experience, but I also think it's important that, as artists, we don't just create art that is victimizing. I want to change the narrative for my people. That means creating art that does not put us in a perfect light, or a perfect immigrant narrative that only shows my good side. It's dangerous for us to show our flaws and so I hope that through my art, I can change that a little bit. Have Trump's immigration policies changed how you feel about being out there with your immigration status? It's scary sometimes, especially when I get invited to college campuses to talk about my art. Sometimes I find myself in areas that are "Trump areas" and I do think about it. Who's going to show up? I don't mind engaging in conversation, but I do get afraid of what could potentially happen. When Trump got elected in 2016, I got a lot of calls from people being worried, but I'm not going to let this administration throw me back in the closet. I am not going back to pretending I'm not queer or not telling my undocumented story because there are still kids out there who might feel alone. If they come across a piece of my art or a video about my story, they know they are not alone and that we've been through this before. How do you cope with the recent news about Trump's immigration policies? I feel like I built a really thick skin over the last couple of years. 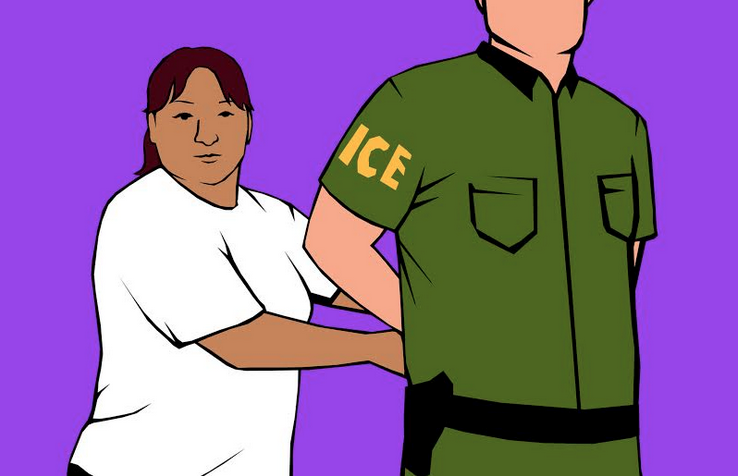 I always look to my friends and other undocumented people in my community. 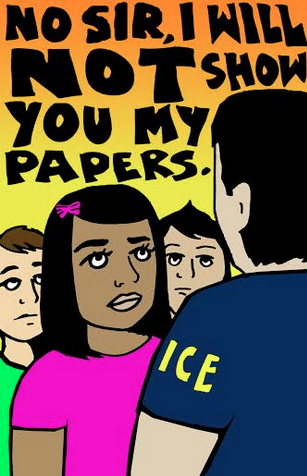 I could talk to another undocumented person and sometimes I don't even need to say anything, because they get it. It's not just about being on the streets rallying. It's about being there for each other, whether that means a hug or living life and going to the movies. Just living a normal life really helps us cope with the current situation that is happening. Which one of your posters is your favorite and why? One of things I love to do while creating posters is collaborating with other folks. 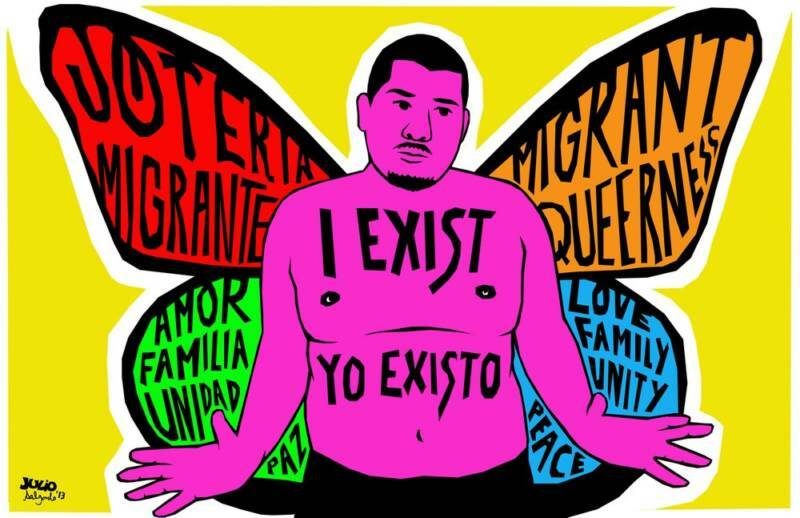 In 2013, I created the images for the I Am Undocu-Queer poster series. 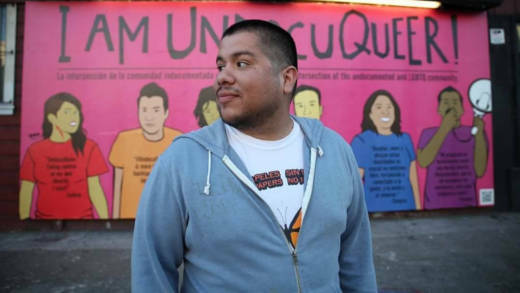 "Undocu-Queer" is a term that means that you are undocumented and that you're queer. It was a word born out of an intersection, being intentional about talking about these issues. Collaboration, for me, is very important because a lot of the people that were part of the series were people who had been leading civil disobedient action, and a lot of them were undocumented and queer. In the immigrant community, we had a lot of people who were very religious. When it came time to talk about queer issues, they would be like, "Let's not talk about that." To me, that's very hypocritical. When you are fighting for social justice, you can't pick and choose. "Undocu-Queer" really connected the dots for a lot of us and I got to collaborate with a lot of folks I admire, who are amazing organizers, who are people getting themselves out there and really informing the artwork that I do. I use a lot of bright color and I am very intentional about that because, as people of color, we are always sad and we are always worried what's going to happen, but we are also joyous. We party. We celebrate and, to me, using bright colors is my way of celebrating my communities. What's the role of art in political and social movements? Our role is to document what is happening right now. In the past decade, there have been a lot of undocumented filmmakers using video and creating content and really documenting our experiences. I think those are documents of what's going on because, in the future, people might look back to what's happening right now and the last thing I want people to think about us is that we were victims. We were victims that were oppressed, but these videos and these pieces of art are documents that show we were also resilient and creative. What are your future goals and projects? One of the things that I am working through with my art is to think about the future because, as an immigrant, the only thing we can afford to think about is the present and how we are dealing with what's being thrown at us. I've been talking a lot about documenting the past and documenting what's happening, but it's really hard thinking about the future without feeling a little bit less hopeful. "What's next? What is this administration going to throw at us?" Personally, I want to infiltrate Hollywood. The ways the rest of this country learns about the other is through TV and film. If we think about why there was more support for gay marriage in the last couple of years, it's because you had shows like Ellen, you had Will and Grace. You had characters that, all of the sudden, people can relate to, even though they were gay characters. That really created a shift in narrative about the LGBT community. Not everybody goes to a rally or takes a class about immigration in their community college, but a lot of people watch TV. In order for Hollywood to tell our stories correctly, we need to be the ones telling those stories. We need to be up there, speaking on our own behalf because that's the only way that those stories are going to be honest and true.